Home Guest Authors What was I trying to say? Because sometimes it is not enough to know which figures you want to photograph, which backdrop to use, which situation to show. Sometimes you have to dig deeper and ask yourself what you really want to say. Though I sometimes find it hard to put this aspect into words, I would like to try and shed some light on it in this post. I opted for describing the process. 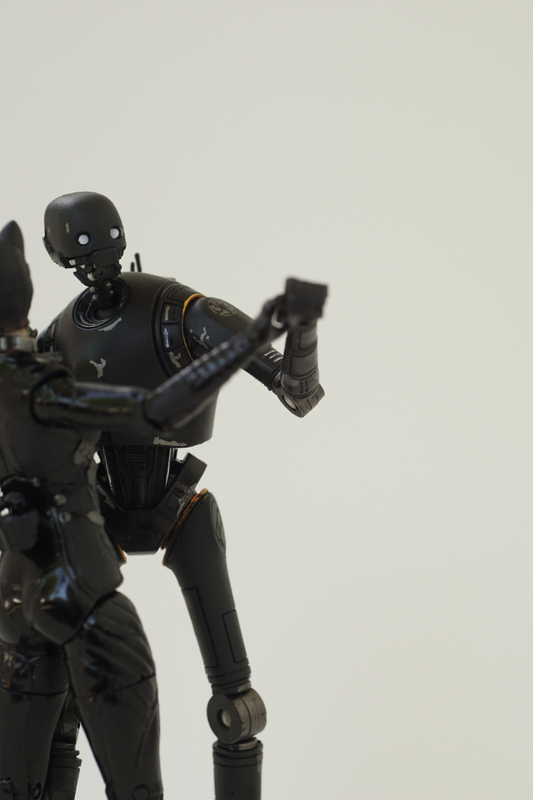 It seemed K-2SO came to like cats and it appears to me he does not waste another thought on getting involved with someone from an altogether different universe. Hence I thought Catwoman would make a good partner for him. I was also attracted to that pairing by the aesthetic potential of her black attire. 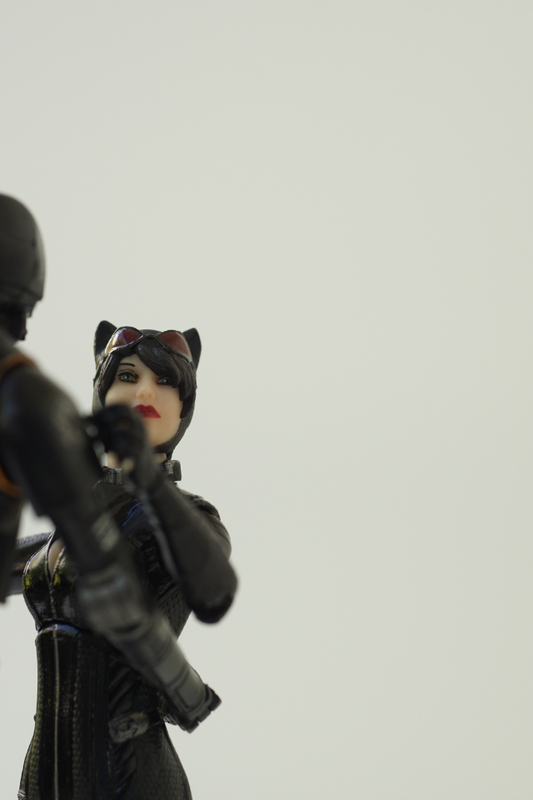 When ordering the Catwoman figure, I had several ideas for pictures and short stories. And after it had arrived in the mail, I realized that two articulated figures – one female, one male – provided a great opportunity to share another hobby. Making these two dance was a challenge though. At times dancing seems to defy gravity. 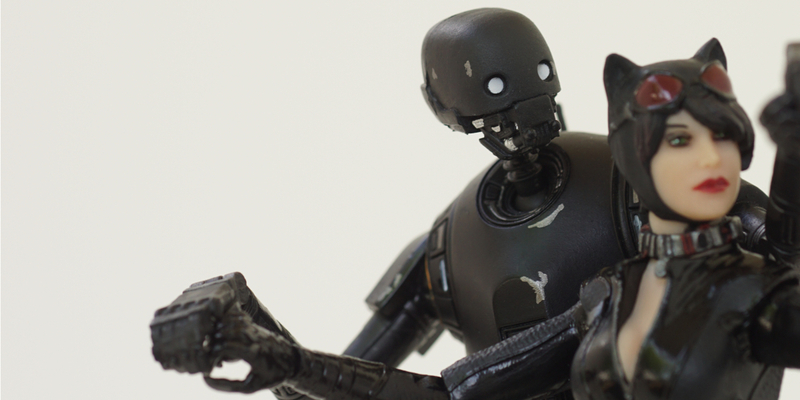 At times K-2SO’s knees are too wobbly (not to speak of his general posture). At times the six inch figures’ articulation fails to suffice (I am talking basic spot turns here, no Rock’n’Roll acrobatics). But after I got used to these limitations, I mostly worked around them. The real challenge started after the first rounds of photographing when I found the pictures boring, simply boring: Two plastic toys more or less entangled with each other … so what? As a consequence, the next step was using different backgrounds and throwing in a lot of fancy lighting. Which was better. After that, it took a couple of Salsa pictures to make me realize that showing the dancing couple in a full shot was not always the best idea. So I tried some more medium shots and close-ups to pursue this idea. Still, only few pictures met my expectations. The Salsa narrative is what I think it should be, throw in two or three more pictures I might want to share, and that was that. Frustration began to sneak in. What kind of pictures would I have liked to see? What am I so disappointed with? Why don’t I feel I’d achieved enough? Meanwhile, a comment by Janan Lee on G+ nailed it: “Really like the abstract element of this.” Yes! Obviously, I’d half conscioulsly wanted to make something more abstract! Which, for me, always implies considering the picture plane ‘as such’ among other things. And isn’t dancing about space just as well as about music and movement? And couldn’t focusing on the picture plane and its perimeter amplify a sense of movement? I had thought about adding motion blur and dismissed this idea at an earlier stage – in hindsight I might already have felt this was ‘too realistic’ then. And I had tried a more abstract approach now filed under ‘near misses, boring.’ What if I combined what I’d learned from the close up shots in the Salsa series with an high key approach? And I did. Now I think I got what I wanted. And I finally feel like instead of pictures of toys, I have made pictures with toys. What is your experience? Do you tackle a topic using various approaches? Do you take a step back and reconsider once you get the feeling you’re ‘not quite there yet’ with your pictures? Great, great post! I go similar way. I start it in my head, where is this perfect image I pursue. Mostly this perfect, imagined shot is really best and I try to make it real as much as I can. But sometimes during shooting, when I’m not impressed with effects I take a step back, start to ask what I really want to achieve and try something different. That was the case of my “leave your hat on” shot (by the way it was partly inspired by your shot with shutter). 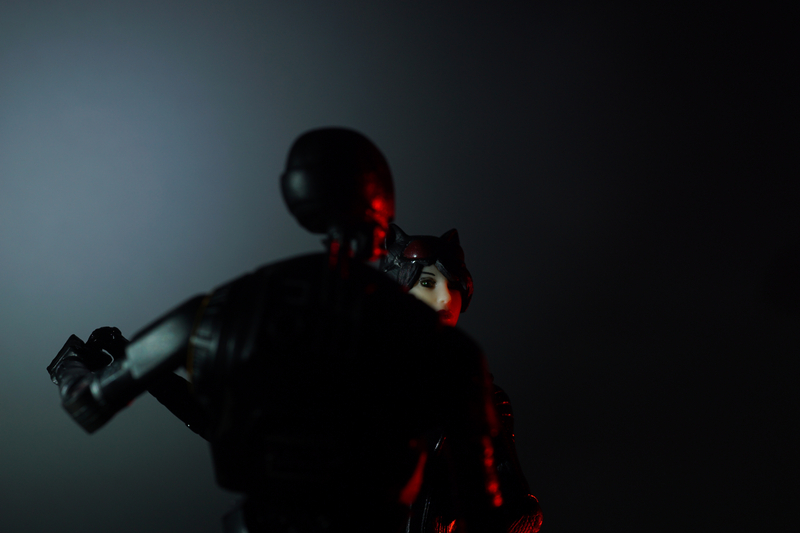 First I wanted to be close to movie scene and show the whole minifig but it didn’t work, both with minifigure and light. But when I changed the angle in result of a little mindstorm, eveyrything everything was where it was supposed to. So yes, asking yourself what do you want to say is crucial and effective! Thanks Tomasz! Good to hear I am not the only one trying again … and again. In my eyes, your “leave your hat on” photo was really worth the extra effort! 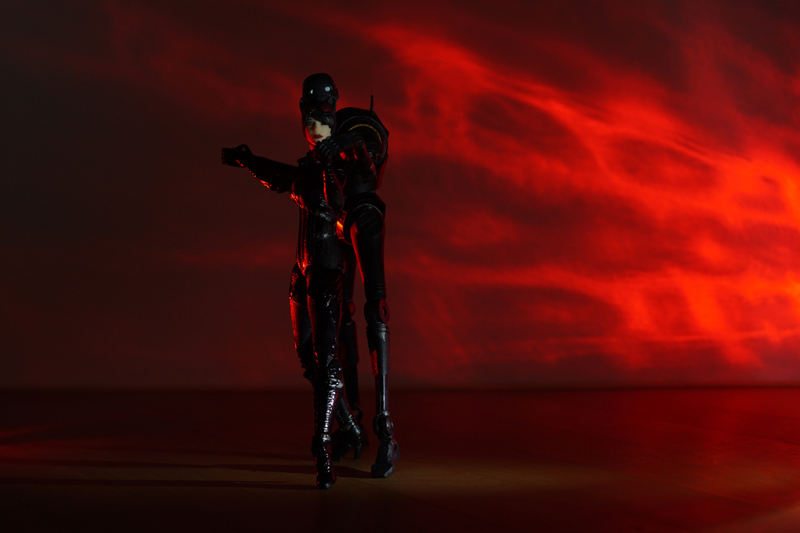 I, too, find that showing the whole figure often does not work well (although with HO figures, you often do not seem to have a coice, at least not with my equipment…) – in fact that was an important lesson I learned from making these dance pictures. Beautiful job, and really helpful to hear you walk through the process. “And I finally feel like instead of pictures of toys, I have made pictures with toys.” <– This is such a great distinction. Thank you for sharing this, Tobias! Thanks, Teddi – I was really happy to come up with that distincion because it seems to sum up something very important (to me) in so few words. And I loved sharing these thoughts! This. Exactly this. 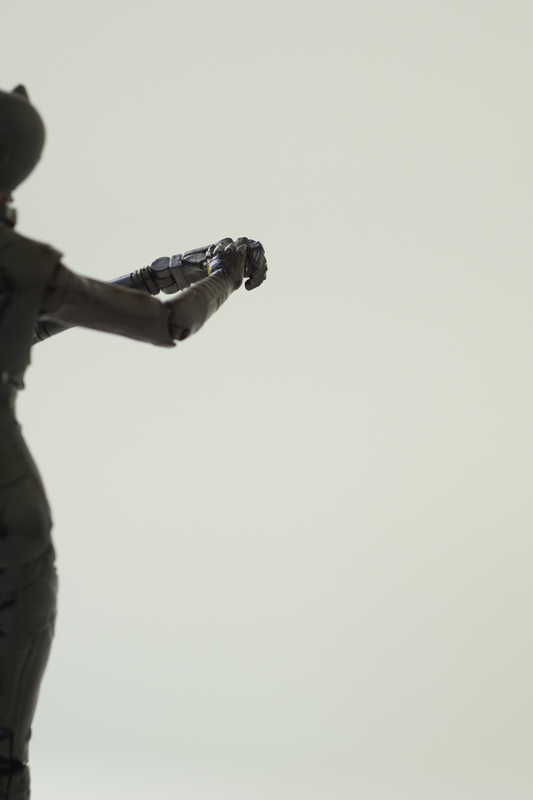 Making images *with* toys, not of toys. That is the difference between craft and art. Thanks Dave! And sorry (@all) for replying so late (something I usually try to avoid, but this seems like the first opportiny to try and come up with some halfway suitable responses). Astrid, thanks! I really enjoyed your “Why” post – and like so often, did not really get around to commenting. Hope to see more of your work. Hi Tobias. I loved this post and appreciate your insight and vulnerability. I love the photos you shared and the evolution you walked us through. Thanks for the inspiration! Thank you, Doug. Vulnerable – I did not see it while writing but I think I understand what you mean. Well, this is what happens when we do not only claim to “try again, fail again, fail better” but act accordingly. Glad you enjoyed this post!